The Turf Tiger is Scag’s largest offering in their commercial-grade zero-turn riding mower lineup. Professional landscapers and those serious about their lawns choose the Turf Tiger for its top-of-the-line quality cut and its ability to complete large jobs fast. Add dependability, comfort and power and we have the ultimate professional-grade zero-turn mower available on the market. Many unique features set the Turf Tiger apart from the competition as it leads the pack in quality, durability, and power. The Velocity Plus Deck. Known for its unmatched performance, it gives a clean, ultra-smooth cut even in less than ideal conditions. The cutting deck is made of high strength steel nearly ½” thick. A patented Custom Cut Baffle allows for adjustment of the airflow under the deck for superior performance in all conditions. High-strength, hardened steel blade spindles with tapered roller bearings drive the triple Marbain cutter blades. Powerful Engine Options. 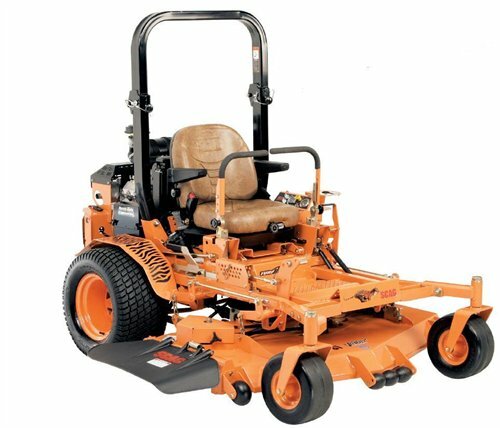 The Turf Tiger is available with a 25 – 35 HP gasoline Kawasaki, Kohler, or Briggs Vanguard engine from as well as a 25 HP Kubota Diesel engine. These engines maximize power and reduce fuel consumption putting more money in your pocket. Two propane powered engines are also available from Kohler and Kubota. Durable, Reliable Build. The Turf Tiger is built on a high-strength double-tube steel frame ensuring years of dependable service. The heavy-duty drive system has dual 16cc Hydro-Gear pumps and high-torque wheel motors. The heavy-duty Ogura clutch has up to 350 ft. lbs. of holding strength. Solid power is delivered to the deck with a heavy-duty drive shaft. Large rear drive tires give outstanding traction and a smooth ride. The front caster tires are flat-free reducing maintenance and keeping you on the job. Superior Operator Comfort. Operator comfort has not been forgotten in the pursuit of quality, powerful mower components. The Command-Comfort operator station can be fully adjusted to meet the operator’s desired settings. The torsion spring suspension seat adjusts according to the operator’s weight for maximum comfort. The high back seat is fully padded with adjustable arm rests, back angle and front/rear adjustment. Steering control levers can also be adjusted to fit the operator. The height adjustment pedal can be adjusted to 3 positions for varying operator height. A cup holder keeps a cold beverage within arms reach for hydration on the go. ScagOEMParts.com knows that a down machine means loss of income. Replacement OEM Parts are IN STOCK and ready to ship – helping you get back to the job as soon as possible. Use the online parts lookup to find the exact part you need for your Turf Tiger.